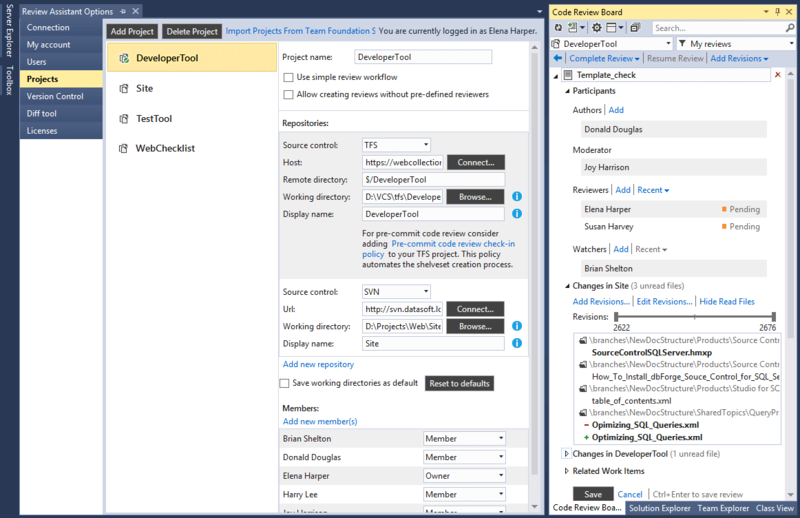 Review Assistant is a code review plug-in for Visual Studio. 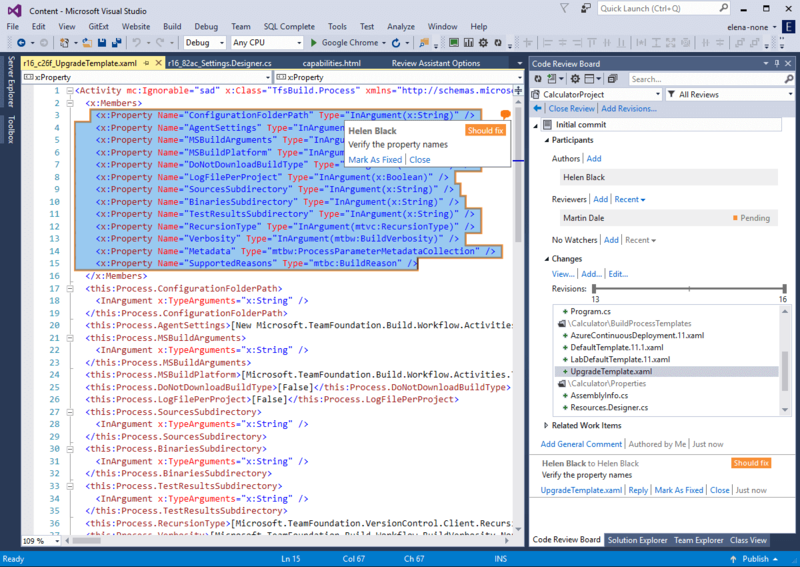 Our code review tool allows to create review requests and respond to them without leaving Visual Studio. Review Assistant supports TFS, Subversion, Git, Mercurial, and Perforce. Setup includes unlimited 30-day trial and a free plan. Get up and running in 5 minutes. Most developers do not like to switch between their IDE and other tools while working on a code. Knowing this, we have integrated the code review process into the development environment as far as possible. You can now create review comments directly from the code editor. The Code Review Board window displays created reviews and allows you to manage them. What is more, Code Review Board contains all code-related discussions. Another advantage is that Review Assistant can be installed without Visual Studio. Review Assistant lets you choose a simple or strict code review workflow for your projects. Any developer can start post-commit code review on any set of revisions. Code author is automatically pulled from a repository. Multiple code authors can be assigned to a single review. Moderator role is available in the strict code review workflow. One review can contain code from multiple repositories. Unreviewed files are highlighted on Code Review Board. Code reviews are about improving your code base. Comments and discussions within your team are the heart of the process. Review Assistant supports threaded comments, so team members can discuss code without scheduled meetings. Add comments on specific source lines, blocks of code, files, or the entire review. Flag comments as defects that need to be fixed. Provide comments on binary files, such as images. Start discussions in code, without creating a formal code review. Unread comments and replies are highlighted. Review Assistant supports multiple comment-fix-verify cycles in one review. Author can instantly see open comments in the code editor. Author can restart a review by adding revisions with fixes. A reviewer can see exact changes made by an author according to comments. 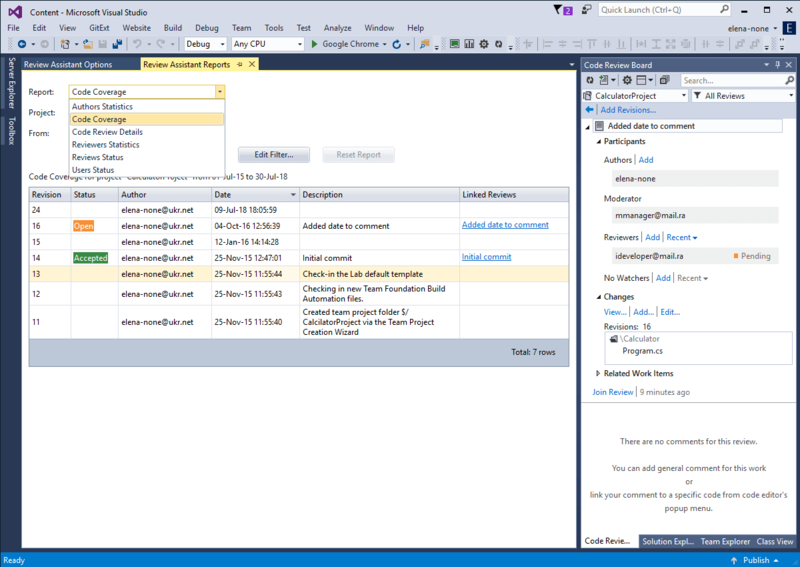 Review Assistant provides deeper integration with TFS and Visual Studio Online. Quickly import TFS projects together with users to Review Assistant. Start pre-commit code review using shelvesets. Use our check-in policy to prevent checking-in code without a review. Review all changesets of a work item in one click. View work items related to a review on Code Review Board. Set up Review Assistant server to send email notifications about code review events. 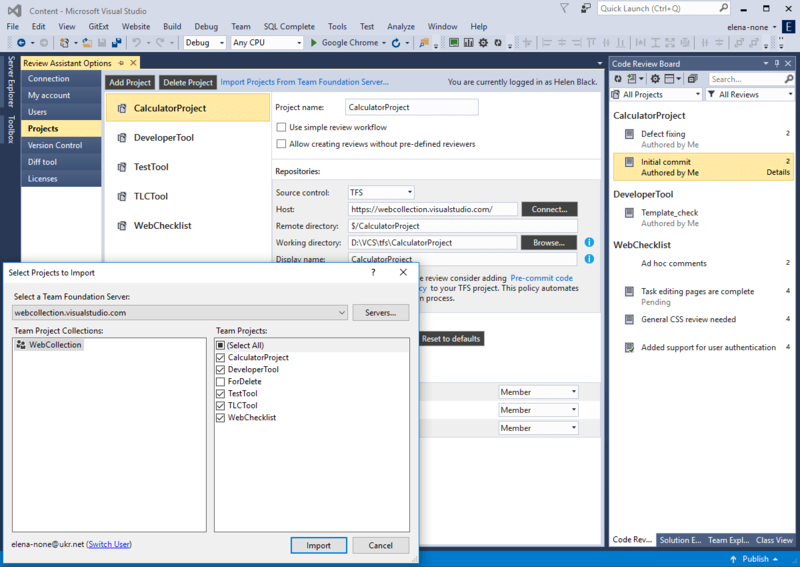 Client provides additional pop-up notifications within Visual Studio. You choose how many notifications you want to receive. 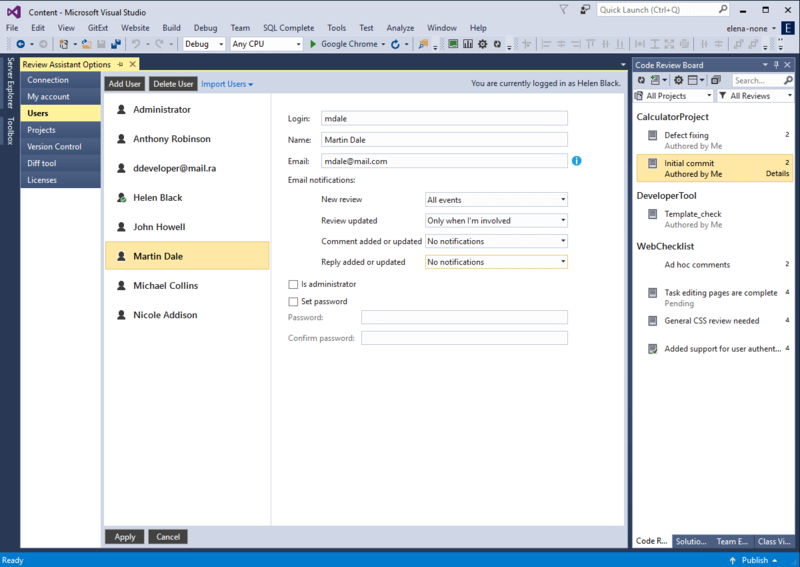 Custom URI scheme enables navigation from email client to Visual Studio. Review Assistant provides a set of code review reports that help you steer the code review process. Reviews Status report provides a view of who might be holding up reviews. Code Coverage report helps you tracking revisions being reviewed in a repository. Detailed report allows exporting a review with comments to a printable format. Statistics reports provide you performance data about authors and reviewers. View code review statistics and reports. 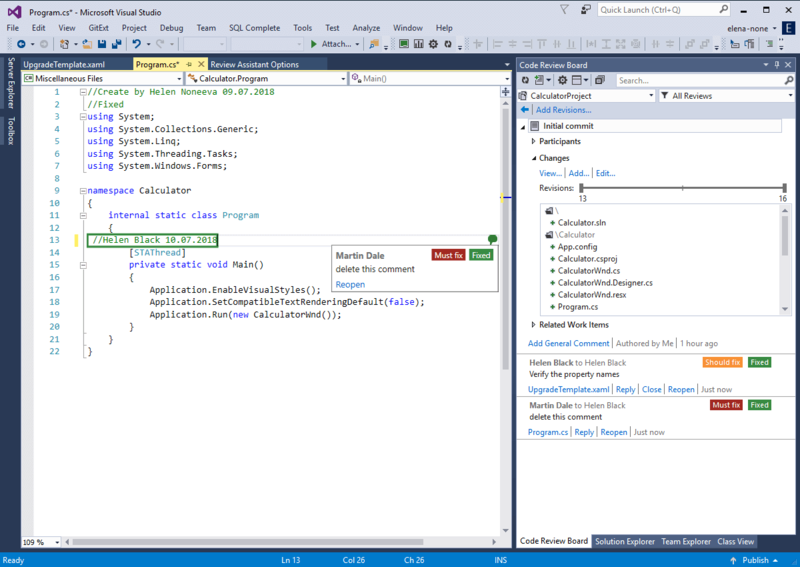 See Visual Studio Code Review vs Review Assistant for details. Learn best practices of effective implementation of code review into software developers' workflow. Learn how your team may benefit from implementing a sustained code review of software source code into the development process. 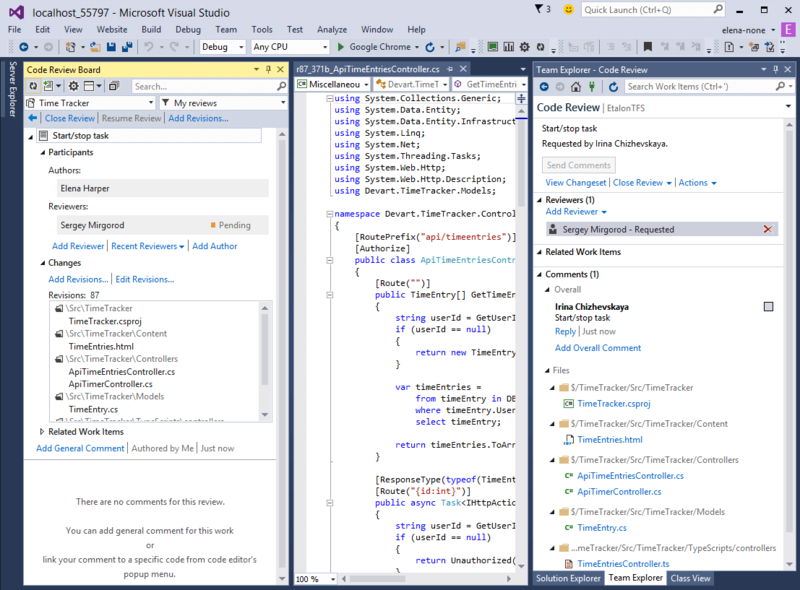 See why Devart's Review Assistant is a way better than Visual Studio's built-in code review tool. Choose Code Review Bundle and get two code review products with a double discount. You can get a significant discount, and even a free license, by spreading a word about Review Assistant. Get 50% OFF for switching to Review Assistant from competing tools! Our team has been using this tool with great success. It has great features such as the ability to leave review comments directly in the code being reviewed, when re-work is needed the tool handles subsequent revisions very nicely, the use of VS diff tool, etc. Everyone is very happy with this tool.